Thank you Shape Mags for partnering with me. Thank you for supporting the brands who support this blog. As always, opinions are only my own. Aimery's second birthday is coming up in a few weeks, and all I can think is "Wow, I finally made it." Although Aimery is officially in the terrible twos (well, we've been here a while! ), I have finally made it through the hardest years of his life. Don't get me wrong, I have baby fever like crazy because I miss those middle of night feedings, and also miss the days where he wouldn't run circles around me and yell "NO!". But I also love the little boy that he has become and I'm looking forward to this next stage of life with Aimery. Until preschool starts, my mom has been watching Aimery during my work hours and I take over in the afternoons. The two of us have really been working on Aimery's development this summer and making sure he reaches all of his milestones before his second birthday. One of the major things that have helped with his development is having him play with Shape Magnets every day. It's so important that two year olds begin understanding color and shape recognition! Although every child is different, there are certain milestones that are important to reach during this stage. Here are the developmental milestones your child should reach before their second birthday! We are really working with Aimery on his language and shape recognition this month. Because we taught Aimery sign language, he's a little behind in his speaking vocabulary. But this week he has started replacing his signs with using words like "cup" and "help". For shape and color recognition, Shape Magnets has done WONDERS for us. After a few days of playing with ShapeMags, Aimery has begun to learn how to separate different colors and shapes. 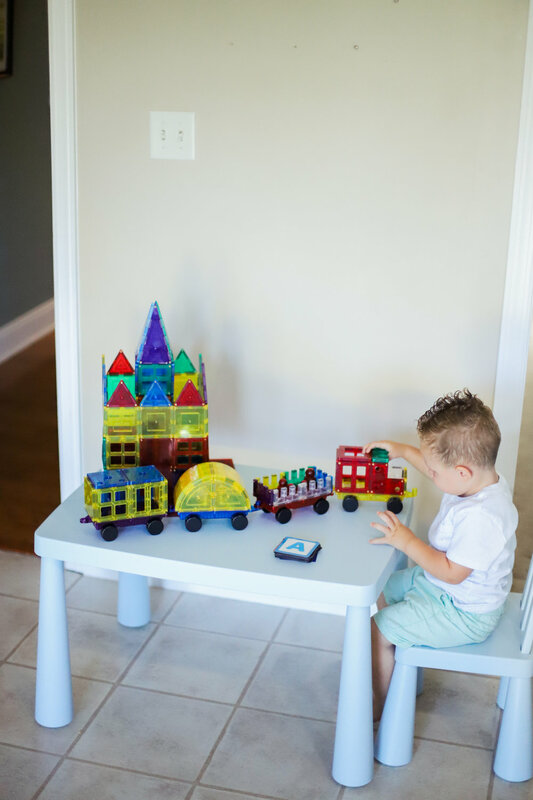 He will spend hours playing with Shape Magnets and create castles, trains, and car ramps! I ordered the window and door set, 124 piece set, and pastel and neon set for him and his development is already improving. Shape Magnets are also great for building fine motor, critical thinking, and even math skills! Has your child reached their developmental milestones for age two? Comment below more milestones you think are necessary for this age!